James Vaughan scored against his former club as managerless Huddersfield beat Crystal Palace to record their first win in 13 Championship matches. The Norwich loanee netted midway through the second half, running on to a Scott Arfield pass to slot home. Yannick Bolasie came closest to equalising for the visitors but his long-range free-kick was narrowly wide. Ian Holloway's men missed a chance to go second, while the hosts climb to 16th, eight points clear of relegation. Both goalkeepers had been called into action early on as Scott Arfield tried his luck from distance for the hosts but Julian Speroni in the Palace goal comfortably held on, while Bolasie stung the palms of Alex Smithies at the other end. Neil Danns came close to opening the scoring for the Terriers but saw his effort pushed away by Speroni, and the Eagles' Glenn Murray also had a chance just before half-time, latching on to Andre Moritz's ball over the top, only to send his effort over the crossbar. The home side finally broke the deadlock in the second period, Arfield's superb pass releasing Vaughan who kept his cool to score his fifth of the season. 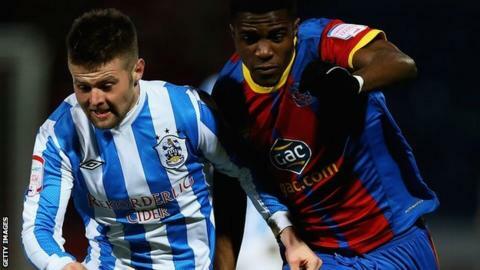 Jermaine Easter came on for Palace for the last 15 minutes, and he flicked a header narrowly wide of the post as Huddersfield secured three points for caretaker bosses Mark Lillis and Steve Eyre.